Greetings! Welcome to The Paper Players Fall Blog Hop! The entire team, along with the fall guest designers, has created some beautiful creations to wow and inspire you. 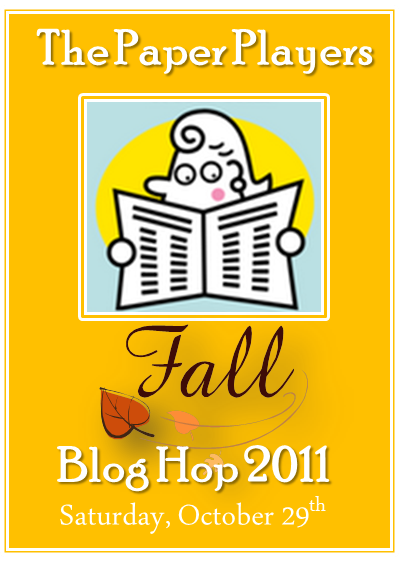 Some of the Players even have blog candy to share, so be sure to make your way through the entire hop! I have 2 projects to share with you, so let's get started! When I hear fall this year, I automatically think SPICE CAKE! :o) This is my absolute favorite paper ever and I can't stop using. Now there seems to be a bit of debate about Pool Party being a fall color, but it coordinates so well with the others that I think they've welcomed it into their mix. One of the best ways to show off any gorgeous designer paper is to make a quilt card, so that's what I did. Isn't it pretty?! I added some embossing and sponging to really bring out the beauty and add some texture to the card. I thought my card could use a matching treat box, so I pulled out my Fancy Favor die and made this cute box. 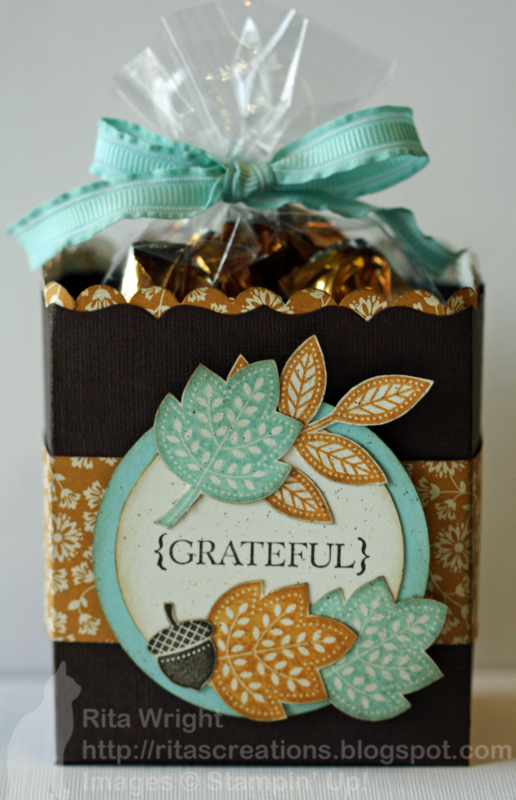 I decorated the front some some gorgeous leaves from Day of Gratitude and added some sponging to them as well. I had to use my Spice Cake here too of course, so I added a little belly band of the More Mustard pattern. The box holds some yummy Godiva chocolates in a cellophane bag that has been stuffed with a bit of homemade confetti and tied with Pool Party ribbon. I hope you enjoyed my projects. 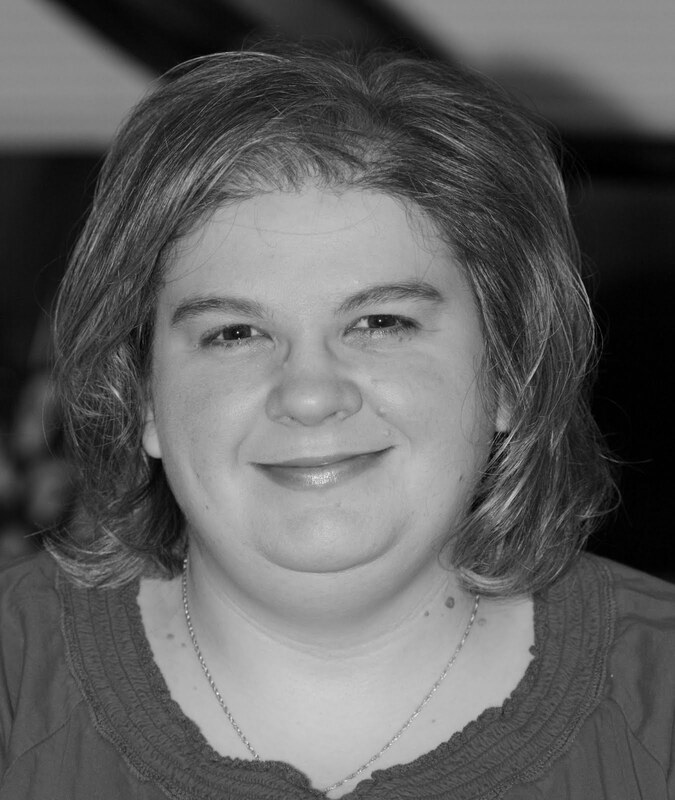 Before you head over to Tara's blog, take a minute to sign up to follow my blog and leave me a comment. I'll be picking a random winner from all the comments to send this lovely card to next Saturday (November 5th). Be sure to visit The Paper Players challenge blog tomorrow for a new challenge! I love both of your projects!! I'm thinking I could make the treat box for the first Bunco night I go to. Thanks for the inspiration!! Oh wow Rita, you have been busy and what a wonderful set of craftiness. Love all the texture on your card, its just so full of lovely colour and very striking. The your treat box os just an amazing gift too. Happy crafting. Beautiful card and treat bag! The colors look great, too! Great card and goodie box. That is my favorite paper too. Great projects. Thanks so much for sharing. Love them - love that treat box!! I made a similar card at my last stamp class, I'll have to post it!! Love these paper and stamps!! Yum-oooo! I love these projects and the colors you've used! Pretty card and treat box. Love the new Pool Party color. I would have never thought about more mustard with pool party - what an awesome combination. 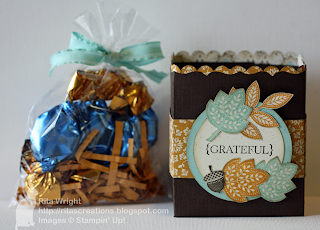 What I like best is how simple this card and treat box is - but it makes such a big impact. Rita, I agree with you. Fall equals Spice Cake DSP!! Love your card. My breath was taken away when I saw these projects. The colors you used are absolutely georgous. I love pool party and find it pleasing to the eye with the fall colors. I've also had my eye on this stamp set and have seen many projects made with it. Your creativity is an inspiration and I would love to be the proud recipient of this card. Great projects. Very pretty colors and design.Love the Spice Cake DSP also. It is my favorite. Another fresh idea using the spice cake dsp to create the gift box. Thanks for the inspiration. The quilted look is beautiful and really is the perfect showcase for this lovely paper! Wonderful, Rita! Nice fall project! Always love when a present has a matching card! Pretty projects Rita, love the Spice Cake DSP. Both are gorgeous, but that treat box is just divine! I love this DSP too...it's one of my faves. You've used it perfectly in both cases. I love this color combination! Both projects are great! Gorgeous! love the colors and the leaves. the added texture on the dp is beautiful! Beautiful projects Rita! I love the pool party ribbon...it looks fabulous on your gift bag! Both projects are really lovely! I love this paper, too. Thanks for sharing. Oh this is so gorgeous Rita! Love the quilted look and these paper just lend themselves to it! Your treat bag is adorable and would be such a fabulous hostess gift for Thanksgiving! Love the belly band of DSP. Beautiful projects, my friend! Beautiful card & treat box! I love the Spice Cake DSP. The quilted card is gorgeous - Spice Cake and Pool Party - fabulous! And your treat bag is adorable! Wonderful creations - you rock! Beautiful card and gift box!! Your projects are just up my alley! Lovely card! I think the spice cake "quilt" is super for fall. Rita what a gorgeous set! Love the colors and your card reminds of a cozy quilt (like Ann Schach's too) which I happen to be wrapped in right now going through this fun HOP. LOVE your treat box too. Fancy Favor is my favorite of the boxes. So versatile. Hugs. Thanks for sharing your projects. I love the colors, they go together so well. You did a great job at putting them all together. Wonderful job on your projects. I think every one just loves the Spice Cake paper. Your card is just lovely, and your treat box a treat in itself. Pool Party is my favorite in-color and I am finding a way to use it year round. Both mouthwatering projects, love the quilt pattern on your card and your treat box is just beautiful! I'm going to have to whip up some of those for my kids teachers! Love this DSP! Fabulous matching card and treat box. 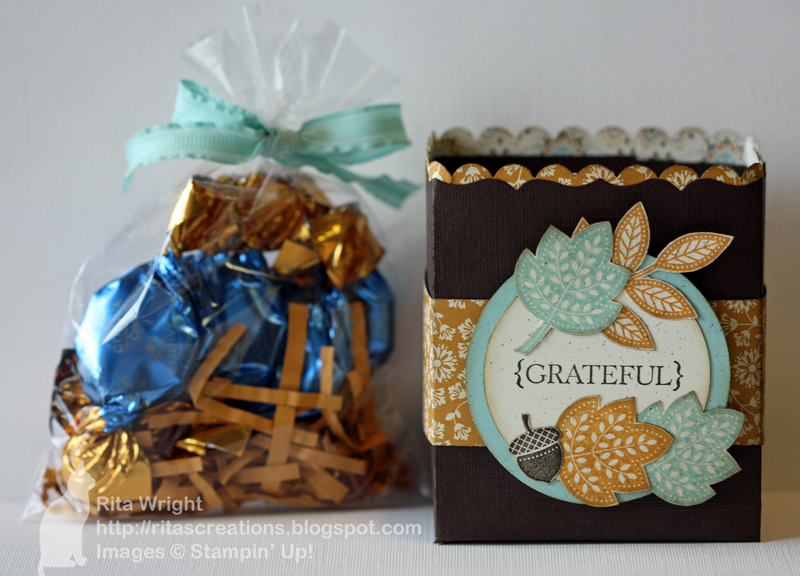 The texture on the quilted card adds just the right touch, and the treat box, well, it is super cute! So much eye candy and taste candy! Both are fantastic. Beautiful card and darling matching box!! Rita they are both so stunning! I love the way you've showcased the dsp and it looks so gorgeous with all that embossing. The box is beautiful too, love the colours you've chosen. Would love the card. I agree the colors in the DSP are gorgous. Super good job with the quilting. Have to try that one of these days! Love the matching set and the colors you used. Great projects! Both projects are awesome! Thank you for sharing! Love the card and treat holder! I think I signed up before for your blog, I will check it out. I love the quilted look to your card. A bit similar to Ann's but a whole different look! Then, the treat holder is just too yummy. Beautiful card! Love the Spice Cake DSP, and your right, Pool Party gives the perfect POP to the fall colors. Thank you for sharing and the chance to win candy! Rita, I love your work. I would love to have one of your cards! Two very cute projects! Love that dsp. Thanks for sharing. Pool Party looks great with your Fall colors. Terrific projects using Day of Gratitude. Beautiful. I love both the card and the treat box projects. I am loving the Spice Cake DP. I have the perfect friend to send this spice cake quilt card to. Pool Party really makes the fall colors pop! Both are beautiful...Love the projects and your blog. LOVE this card and the matching gift box Rita! Thanks so much for the inspiration, I know what I want to present at my next card class!!! Have a wonderful day! Love, love, love this spice cake paper! It is so yummy and warming to my heart! Your card looks like a warm fall quilt I could wrap up in and sit next to a fire sipping hot cocoa! Gorgeous card! Hi Rita, your card and treat box are beauties! I wish I could follow, but Blogger is only allowing me to follow from a sidebar and it doesn't work using the follow link up top. I see your Followers title, but no pics are showing right now. So, I will bookmark your blog so I don't miss anything in the future! Happy to have hopped in! What an adorable treat box. Very festive for the Thanksgiving table. Love the colors. Thanks for sharing and looking forward for more great projects. The spice cake dp seems to be popular. I really like how you used it. Rita - these are so gorgeous. Love that box you made. So perfect for fall! Love the card and box - so pretty! SOOO pretty! Pool Party is my new favorite color.... I'm even using it on my Christmas cards this year :) Thanks for sharing! I love both projects! Will make them for my Thanksgiving place settings. Thanks! Your project are fantastic! I especially love the fancy favor treat box. So pretty! Both projects are wonderful, and I especially love the way you embossing the quilted DSP and distressed it. That's my favorite paper, too! Wow, both of these projects are gorgeous! I love the quilt look and how you embossed it! And that treat box is awesome! I'm going to have to dig into my Spice Cake DSP and Day of Gratitude set after seeing these fabulous projects! Thanks for the inspiration! Gorgeous card and gift bag, Rita! This is such fabulous DSP! What a clever little idea! I just love the nautical look also! Love the blue! I love the Die Cut Patch Work I'm going to have to try that out! And your Treat holders are perfect! Wow! These are TOO gorgeous! The colours are dreamy.